Pioneer AVH-Z2050BT DVD Player + FREE HD CMOS Reverse Camera for only $575!!! Pioneer AVH-Z2050BT DVD Player + HD CCD Lens Reverse Camera for only $615!!! LIVE DEMO OF DVD PLAYER & REVERSE CAMERA available in our store! For any enquiries, you may still contact us at 9844 7828 via WhatsApp (Preferred) / SMS or Call! The Z-Series brings premium in-car entertainment features to the masses, like Apple CarPlay previously found only on our flagship receiver, plus Pioneer's new AppRadioMode+ that now plays video online and offline. The Z-Series multimedia receivers are designed to automatically detect and retrieve content from a connected smartphone, all without requiring user input and configuration. *For the files stored in USB thumbdrive. AppRadio Mode + is compatible with Waze - a social GPS driving/navigation app that offers map, real-time traffic, and various other information for you to access on the large display of a compatible AV receiver. For safe driving, the AV receiver mutes music that is playing whenever the guiding voice emerges, so you can easily hear the guidance you seek. From hands-free calling, wireless audio streaming with artist, album, and song search, simple pairing, and voice recognition, Bluetooth wireless technology has made life in the vehicle much more convenient. All Bluetooth-ready Z-series multimedia receivers can simultaneously connect up to five Bluetooth devices for family entertainment. Additionally, users can browse their media library with upgraded Bluetooth AVRCP 1.6 capability. (1) Optional cable CD-IU201V is required to utilise direct control for iPhone 4S or 4th Generation iPod Touch. Optional cable CD-IU52 is recommended for iPhone 7 Plus, iPhone 7, iPhone SE, iPhone 6 Plus, iPhone 6, iPhone 5S, iPhone 5C and iPhone 5. CD-IU52 and CD-IU201V are sold separately. (3) Compatible with MIXTRAX EZ. Not compatible with full-featured Non-Stop Mix Play using MIXTRAX software that analyses track information. (4) CD-MC20 is required to utilise Auto EQ. CD-MC20 is sold separately. 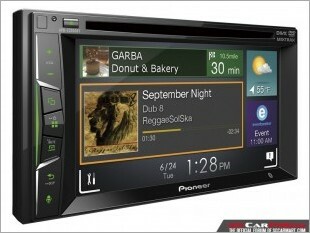 I am interested in the "Pioneer AVH-Z2050BT DVD Player (With HD Reverse Camera)".